Did you have a testing irregularity this spring that may need to be investigated? There are a host of questions that follow. How do you get started? How do you know what to investigate? Who will be involved in the investigation? This webinar will give you information on the best-practice training and investigation protocols that you will need to investigate a testing irregularity. 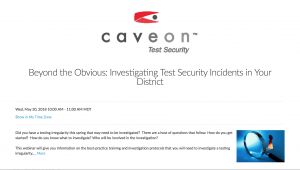 Topics will include preparing investigation plans, training staff, evaluating incidents, gathering evidence, and documents, communicating results, and examples and tips from Caveon investigators. The webinar is free and will last 30 minutes. Register today!